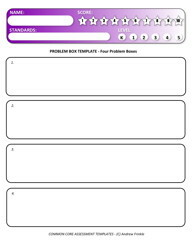 Here are 3 versions of problem boxes with or without work space for 4 questions. Here are 2 versions of problem boxes with or without work space for 5 questions. 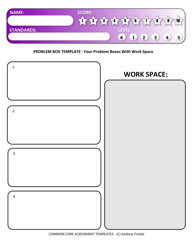 Here are 3 versions of problem boxes with or without work space for 6 questions. Here are 2 versions of problem boxes with or without work space for 8 questions. Here are 2 versions of problem boxes with or without work space for 10 questions. These are very versatile templates. You can cut/paste text onto them, put pictures, put math problems, or do just about anything. They are simply divided into boxes to help your students organize their work. They come with 4, 5, 6, 8, or 10 problem boxes. These ones also feature a box for scratch paper or work space.